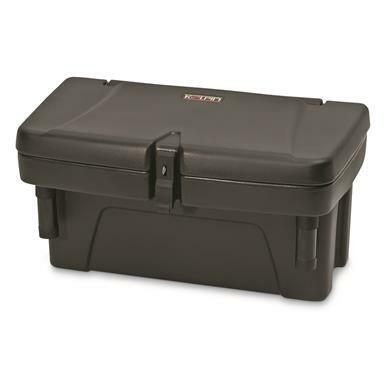 Hard-knock roads require the hard side protection of a Kolpin® Saddle Storage Box Gen 2 on your ATV. Latched lid keeps makes it easy to haul tools over rough terrain and insure your gear doesn't bounce around or out of the back. Installs easily to UTV dump box edge with a flat mounting surface. Outside dimensions: 22" x 12.5" x 12" h.
Internal dimensions: 19" x 8" x 10" h.
Kolpin Saddle Storage Box Gen 2 is rated 3.7 out of 5 by 3. Rated 4 out of 5 by Mudding man from Good product Seems a little over priced for what it is! Rated 2 out of 5 by Tj from Kolpin needs to step up on their product quality. The locking mechanism was bent, made of poor quality, and does not give me confidence that I can lock items in the box and feel secure. Rated 5 out of 5 by Ken the general from I will buy another one for the other side. Awesome product and service.